StonePly stone panels should be protected during storage, setting, and after installation. StonePly should be stored on planks or pallets away from traffic and debris to prevent stains and breakages. If stored for a long period of time, the pallets should be covered with non-staining tarps. After installation, StonePly stone panels should be protected with a non-staining tarp or plastic during the remaining construction to avoid any unnecessary damages. After construction, the stone cladding will need a final wash down to remove any debris or dirt. Acids and brick cleaners should not be used because they could etch or burn away at the stone’s finish. 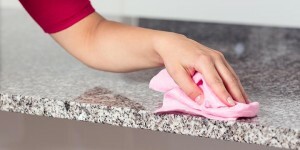 Dirt can be removed from most stones by washing with a mild detergent and water. If stains occur, it is important to recognize the cause of the stain. Any treatments to the stone panels face should be tested in a small inconspicuous area before cleaning the entire unit. Metal fiber brushes shouldn’t be used when scrubbing stones because they may scar or scratch the stone face. Also, any metal residue left from the brush may later corrode or rust and cause staining. Power washing and/or sandblasting is not recommended because it may scratch or scar the face of the stone panels.